I think it would be too embarrassing to admit how often we eat this. Let’s just say “often.” We all love it, and it’s one of those dishes that doesn’t need much tending once you do the first little bit. So it’s very near the top of my list for company, or special occasions, or just when I feel like serving up something warm, beefy, and very comforting. wide egg noodles–at least one 16 oz pkg. I usually add a little from a 2nd pkg. 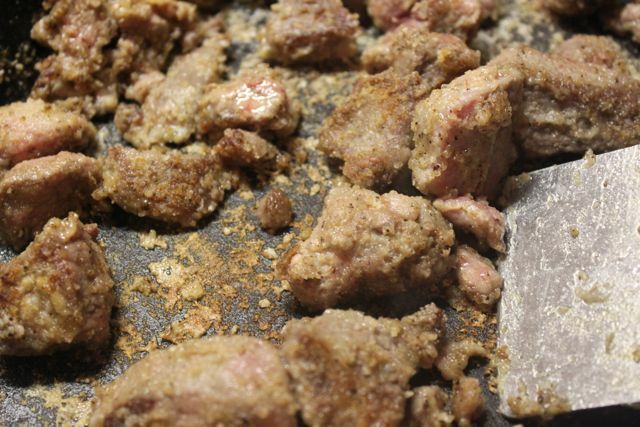 If you’re using stew meat, the cutting-up part is already done for you. Otherwise, cut your round steak into bite-sized pieces, cutting against the grain. 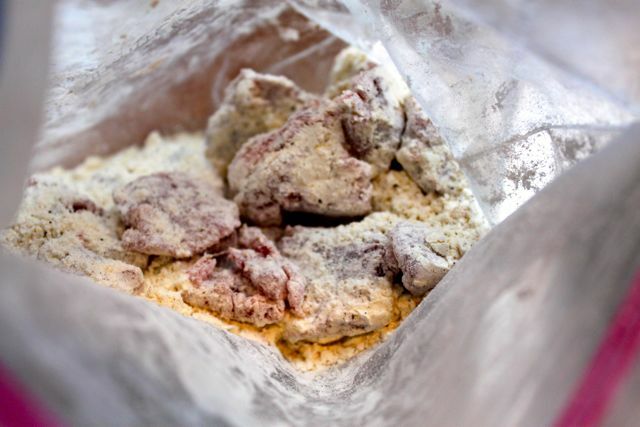 In a big-enough baggie, add about 1 cup of flour, several good dashes of garlic powder, and salt and pepper. Drop the meat in (you’ll have to do this in batches) and shake well. … you’ll want to deglaze the plan after every single batch. I know. That sounds terribly time-consuming. But it makes a big difference in the long run, because all the best flavor is cooked into those browned bits. So once you’ve removed that batch of meat from the pan and placed it in your crock pot, pour a little of the beef broth into the frying pan. 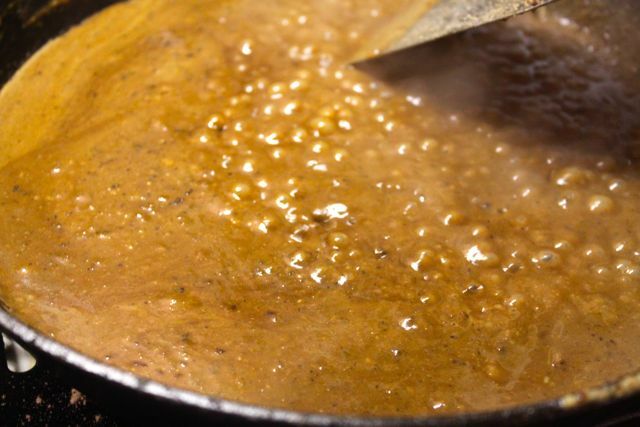 Cook, stirring constantly, just long enough to loosen all the stuck-on brown bits and thicken up the broth a little. You don’t want it so thick that you can’t easily pour it all into the crock pot. 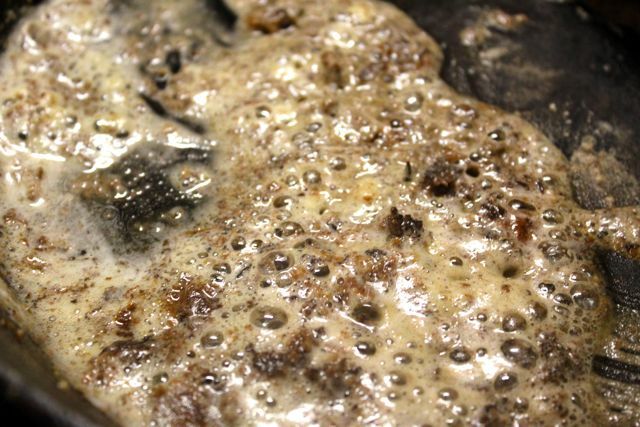 That’s what you’ll do next–pour the contents of the frying pan into your crock pot. Then add a little more oil to the pan and start the next batch of meat. As the years have gone by, I’ve developed a pretty firm cooking philosophy: Use what you have. As a young wife and cook, I would happily jump in my car and drive to the store for one missing recipe item. But eventually I saw how not-wise that is. And now I’ve learned to make do with whatever is in my fridge and pantry. So when I realized I had no mushrooms, I went to plan B: I decided to make a white sauce flavored with the porcini powder I posted about a few weeks ago. 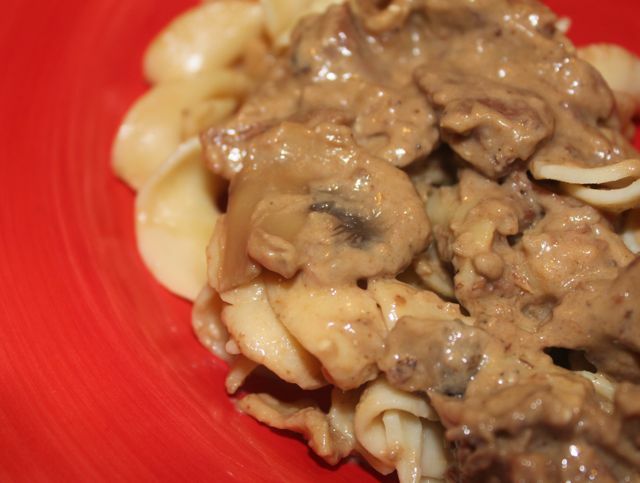 BUT as it turned out, as soon as the entire stroganoff was put together and cooking in the crock pot, Dave called me from the office to ask if I needed him to pick up anything from the store. So I got my mushrooms after all … they just joined the party a little late. Where were we … oh, deglazing. Okay. So here’s how I went about it with my white sauce. After I’d taken the meat out of the last batch (I did three batches of meat), I deglazed the pan as usual, but this time I added about 1/3 cup of marsala wine I had in the fridge from making chicken marsala last week. Just a splash is all you need, plus a little more beef broth. (Alternately, you could skip the wine and just add more beef broth.) I also added a few TBSP of butter and a few shakes of flour. 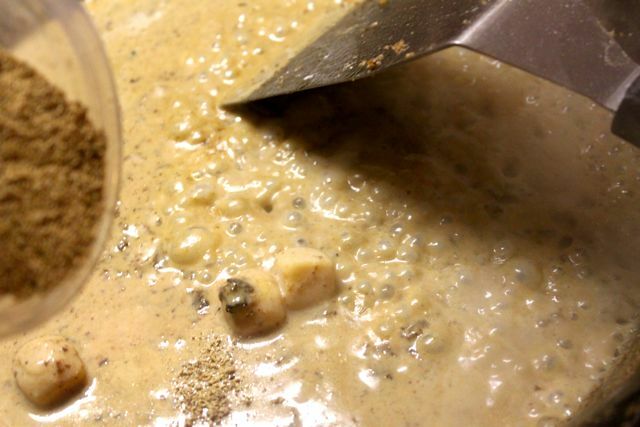 This is kind of a backwards way of making a roux (usually you cook the fat and flour first). Stir this well and keep adding broth as needed to keep it from drying out. At this point, not realizing mushrooms would eventually show up, I added a good doze of porcini powder and four cubes of frozen, roasted garlic (from the freezer section at Trader Joe’s). Cook this until the garlic melds into the mixture and it starts looking and smelling wonderful. Now add about a cup of half-n-half (you can use regular milk, but it won’t be quite as thick). Stir and continue cooking for a few more minutes, then pour over the beef in your crock pot. To saute the mushrooms, just melt a few TBSP of butter into your pan along with a few shakes of olive oil (I keep mine in a glass bottle with an espresso-type pour spout stopper). Add sliced mushrooms and cook, stirring, until they’ve shrunk a little and have a softer texture. This only takes about five minutes. Add those to the crock pot. Everything from this point on is up to you. If you don’t have a lot of time, cook it on high. If you’ve got all day, cook it on low. If you’re going to be out of the house, make sure there’s enough liquid in the mix that it won’t burn while you’re gone. I don’t think I’ve ever seen cream cheese in a beef stroganoff recipe, but I’ve been making it this way so long it would taste funny to me without it. If you’re a purist and can’t stand the thought of using cream cheese instead of sour cream, then just use sour cream. What you’ll want to do is add it to the crock pot about twenty minutes before serving. But if you want to try the cream cheese, dip into your crock pot with a ladle and get about a cup of the sauce out. Mix this with 6-8 oz of cream cheese and blend well, then pour the mixture back into the pot. Do this about an hour before you want to serve dinner. I season this to taste with extra garlic powder, salt and pepper, and sometimes with a scoop or two of beef bouillon. Have you bought your “Better Than Bouillon” scoopable beef bouillon from Costco yet? If not, grab some chicken bouillon too when you’re there. To serve, dish up some egg noodles and ladle some of that brown, beefy, creamy goodness all over the top. G’morning…i can’t find your recipe for french dip… 🙁 i wrote it down but didn’t make it a permanent home in my cookbook…so if i remember correctly..it’s 1/2 c soy sauce..chopped onions..add water and boullion..in the crock pot…til it’s done it all it’s beefy goodness..right?..